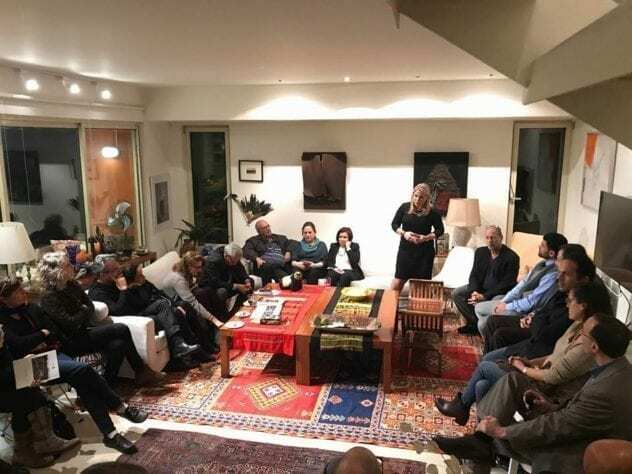 The Public Council of the Arava Institute hosted a salon meeting last week entitled The Humanitarian Crisis In Gaza – Risks And Opportunities. Speakers included Senior Hydrogeologist Ahmed Yaqubi, of the Palestinian Water Authority in Gaza, Tahani Abu Daqqa of the Palestinian Committee for Interaction with the Israeli Public, Knesset Member Ksenia Svetlova, and Salah Mohsen, Director of Research at the social justice NGO Gisha – Legal Center for Freedom of Movement. Panelists discussed the worrying humanitarian situation in Gaza, a densely populated area with a shortage in clean water and electricity, and extensive unemployment. Participants debated a variety of issues, including potential solar solutions to Gaza’s small and large scale energy problems, from households to wastewater treatment plants. The evening was attended by members of the Institute’s Israel Public Council, partners in the Track II Environmental Forum, and Arava Institute alumni.